On October 6 in conjunction with the IMBA take a Kid Mountain Biking Day event, CORBA will be having a fun ride at Malibu Creek State Park at 9:00 am. This will be a ride followed by a barbecue. Kids must have there own bikes and helmets. All ages are welcome! Childhood obesity in the United States has reached an all-time high. CORBA believes mountain biking can help reverse this trend. We need your help to get kids back on bikes. Come join us. This year's Fest is going to be great! There will be great prizes, contests and bike demos, great food and a beer garden. The Cynergy Hill Climb Contest will be for men, women and youth categories and prizes will be gift certificates to Cynergy. For the wheelie contest, check in at the Bike Warrior/Scott booth early to pre-qualify. The winning prize is a trophy and Scott Voltage. Foes racing will be there with demo bikes and Specialized is bringing their big bike trailer and donating more prizes in addition to the Specialized Stumpjumper 2007. If you're planning on attending, let us know your food preference at the Fat Tire Fest web page. REGISTER BY 10/7/07 AND GET 10 FREE RAFFLE TICKETS. ONLINE REGISTRATION ENDS 10/13/07. IF REGISTERING BY US MAIL, PLEASE POST-MARK NO LATER THAN 10/10/07. 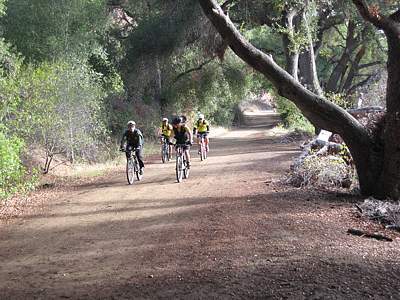 CORBA is working hard on trail access issues and to create new riding opportunities in the L.A. area. We have created a trail user survey to get a feel of what type of riding local riders enjoy. If you ride in the L.A. area, please go to the CORBA web site and take a few minutes to complete the survey. Everyone that completes the survey is entered into a raffle to win a set of Cole Wheels! CORBA needs your support! While you are at the CORBA site click on the membership tab and join or renew your membership today! THANK YOU TRAIL CREW VOLUNTEERS! This past Saturday CORBA-PV had 97 volunteers at The CORBA-PV Trail Maintenance Day at Del Cerro Park in Palos Verdes! Volunteers enjoyed lunch on CORBA and REI following trail work. Great work CORBA-PV and a big thanks to all who volunteered. Meanwhile CORBA participated in Public Lands Day by dispatching the Trail Crew to the Ken Burton Trail in the Angeles National Forest. A great day it was. Thank you to the many volunteers from OTB Mountain Biking Club who came out to maintain the Ken Burton Trail.